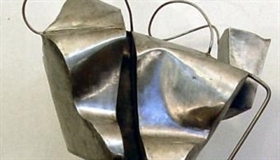 The exhibition "Multiplication in Movement" of the artists Atanas Kolev (sculpture) and Ping Frederiks (paintings) is opening June 25 at the City Art Gallery in Plovdiv (15 Alexander I St.). The Multiplication series consists of sculptures each of which is an experiment of movement, vibrations and sounds. The sculptures feature abstract or geometric figures, connected by springing elements.